Shortages Lead Doctors To Ration Critical Drugs : Shots - Health News Drug shortages may be the new normal in U.S. medical care, experts say. Most drug shortages occur because something goes wrong in the manufacturing process that halts production. 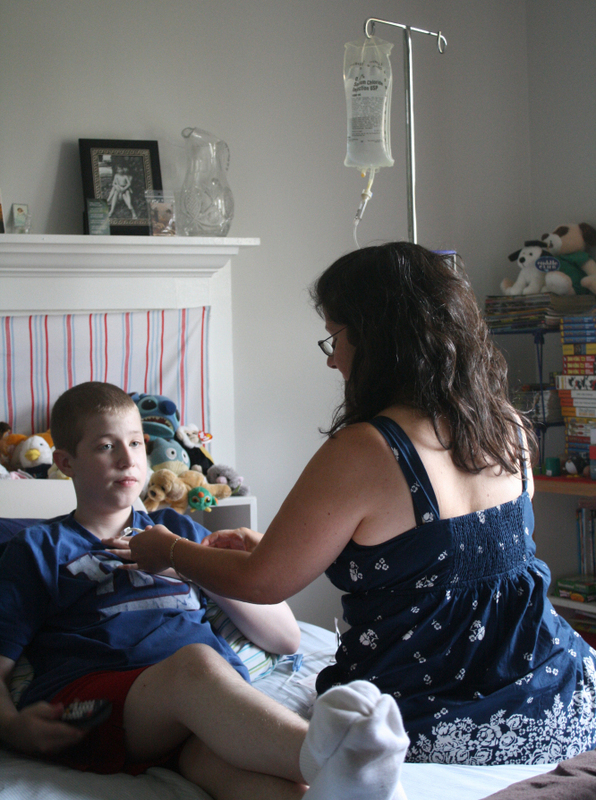 Laura Zakhar connects her son, Kevin, 15, to the "feedbag" that contains his nutrition. Lately, Zakhar has had trouble getting the calcium solution Kevin needs, in part because hospitals have been reserving limited supplies for patients who need it even more desperately than he does. Drug shortages mean a growing number of Americans aren't getting the medications they need. That's causing drug companies and doctors to ration available medications in some cases. "We're now at 213 shortages for this year," says Erin Fox of the University of Utah, who tracks national drug shortages. "That surpasses last year's total of 211. And it doesn't seem like there's an end in sight." The shortages involve a wide range of medications: cancer chemotherapy agents, anesthetics, antibiotics, electrolytes needed for nutrient solutions, and dozens more. One drug currently in short supply is used in critically ill patients to bring down soaring blood pressure. "We know this is a dire public health situation," Assistant Secretary of Health and Human Services Howard Koh told NPR, "and there have been delays in care." According to those who are tracking drug shortages, there have been more than delays. Some patients have died. That's what the American Society of Health-System Pharmacists found when they did an anonymous survey of members. Last week the Associated Press reported that at least 15 people have died as a result of drug shortages. Shortages for each year represent the number of new reports from Jan. 1 to Dec. 31. And last spring, nine Alabama patients died and 10 others got seriously ill after getting bacteria-contaminated intravenous feeding solutions made by local pharmacies. In a report on that episode, the Institute for Safe Medication Practices notes that hospitals are relying more on such "batch" suppliers "due to an unprecedented escalation in shortages" of IV nutrient fluids from pharmaceutical companies. Fifteen-year-old Kevin Zakhar of Bethel, Conn., is one among thousands of patients affected by a months-long shortage of electrolytes — minerals such as calcium, phosphorus and magnesium necessary for normal metabolism. Zakhar can't eat at all. A year ago, his small intestine suddenly kinked, cutting off its blood supply. Surgeons had to remove the entire small bowel, which is where nutrients in food get absorbed. So he must depend on daily intravenous feeding. "The solution has all of his calories, all of his minerals, all the vitamins that he needs," says his mother, Laura, who hooks him up to an IV pump every afternoon. "It's everything that you and I would get by eating." But in August, a pharmacist phoned Laura Zakhar to say a necessary nutrient called calcium gluconate wouldn't be in that week's supply due to a national shortage. "My first words to the pharmacist were, 'Who do I call? Who do I write? What can I do?'" Zakhar said. "And he said, 'Hopefully, it will just be a short period of time, and I don't really know what you can do.'" Checking around, Zakhar found the shortage of IV calcium had been brewing since April, when one of the nation's two suppliers shut down due to contamination on their manufacturing lines. She hadn't known about it because pharmacists had been trying to protect Kevin's supply as long as they could. "My son was one of the last patients they took it from because of his circumstance — he can't take anything by mouth," Zakhar says. One reason that Kevin Zakhar hasn't been able to get the calcium solution he needs is that hospitals have been reserving it for patients who need it even more desperately than he does. Kathy Gura, a pharmacist at Children's Hospital in Boston, points to one of those patients, a tiny infant born only 23 weeks past conception, as premature as a baby can be and still survive. And he wouldn't have survived without the same kind of IV feeding that Kevin Zahkar gets. Gura and caregivers at other hospitals say they have had to divert scarce electrolytes from other children and adults to save the lives of fragile preemies. Gura calls it "robbing Peter to pay Paul." Across town at the Massachusetts General Hospital, New England's largest, pharmacist Paul Arpino says drug shortages were once rare. Now they're routine. Arpino often gets calls in the middle of the night from desperate doctors and nurses. "We try to react as quickly as possible to these shortages," he says. "Sometimes there's not a lot of notice. But when we're informed of the shortage, we really get all hands on deck." He says drug shortages plague every corner of Mass General, from the emergency department to operating rooms to intensive care. Currently, for example, intensive care doctors are coping with a shortage of a drug called labetalol that's used to treat patients whose blood pressure is going through the roof. Labetalol is so scarce that the hospital recently decided to reserve it only for patients having a brain hemorrhage. Dr. Taylor Thompson, medical director of the Mass General's medical ICU, calls it rationing – something most people think happens only in socialized medical systems or developing nations, not in America. But experts say the problem has been building over the past decade, and has accelerated since 2006. "It's really no way to run an integrated health care delivery system, to take cornerstone drugs and have to do without and find alternatives monthly," Thompson says. Doctors and nurses do find work-arounds. They try different drugs or combinations. But that increases the risk of a dangerous medical error. "It would be a bit like a pilot coming to Logan Airport in the morning and (being told), 'We're out of Airbuses, you're going to have to fly a 727. And oh, by the way, you're taking off in 10 minutes.' "
Thompson isn't quite sure why drug shortages are happening so often. "My understanding is it appears that the major problem is business decisions around generic drugs," he says. Most drugs in short supply have been older generic drugs, which are generally less profitable. Hospitals are most affected, because many scarce drugs are intravenous forms, not pills dispensed in bottles. But actually, officials at the Food and Drug Administration say only 11 percent of shortages happen because a company decides to stop making an unprofitable drug. Most shortages, they say, occur because something goes wrong in the manufacturing process that halts production. Whatever the tangled causes, all those involved believe drug shortages are the new normal in U.S. medical care. That's why the Mass General recently formed a task force on drug shortages. Its chairman, surgical oncologist Annekathryn Goodman, says next month the group will begin to confront the agonizing questions of how to decide who gets the available drug when there's not enough to go around. "If it ever gets to a place where you have to choose one patient over another," Goodman says, "that is a very tough, ethical, existential, emotional issue — for us, for the people receiving the care." Goodman is currently grappling with a problem that foreshadows such difficult choices. A drug called Doxil, which is highly effective in treatment some advanced ovarian cancers, is being rationed by its manufacturer right now. Betsy Neisner, the consumer representative on the new drug shortage task force, is a patient of Goodman's who had been getting Doxil. "I was getting it monthly, responding superbly, until July of this year, when I went into the hospital to have my infusion and the cupboard was bare," Neisner says. "They didn't have it. There was a nationwide shortage." She had to switch to an older drug that caused months of terrible nausea and fatigue, and damaged the nerves in her feet. Last Friday she started getting Doxil again after her turn came on the manufacturer's waiting list. "It's really astonishing and terrifying," Neisner says, "because you assume that if there's something that we've invented, that we've made available, it will stay available. And that's not true anymore." More wrenching decisions may be just around the corner for patients with ovarian and breast cancer. A critical drug called Taxol is now on the FDA's shortage list. And Mass General's pharmacists say they have less than a month's supply of Taxol on hand.